mouth, teeth and gums does more than help ensure you have a bright, white smile. even preserving your memory in your golden years. The phrase "healthy mouth, healthy body"
really is true and is backed by growing scientific evidence. teeth or mouth infections to distract you. cardiovascular problems such as heart disease, blockages of blood vessels, and strokes. studies may suggest that maintaining oral health can help protect overall health. and subtraction -- both skills used in everyday life. 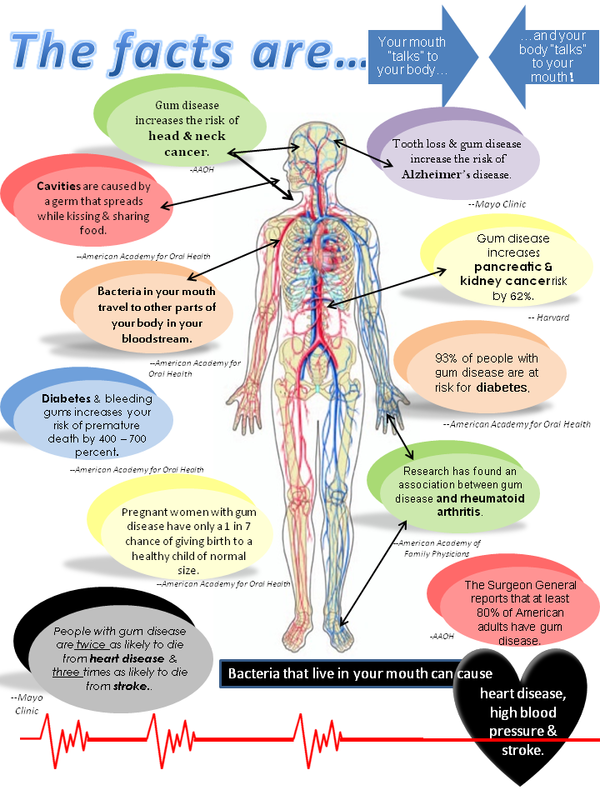 less able to fight off infection, including gum infections that can lead to serious gum disease. severe gum problems than someone without diabetes. 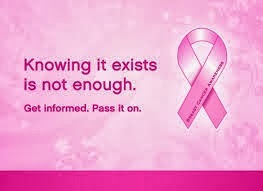 control if you have been diagnosed with diabetes. relationship between gum disease and preterm, low-birth-weight infants. Not all studies have found a solid link, but maintaining good oral health is still the best goal. it good practice for the role modeling that lies ahead for all new parents. Sally Cram, DDS, periodontist, Washington, D.C, and consumer advisor, America Dental Association. National Healthy Mothers, Healthy Babies Coalition. American Dental Association: "Healthy mouth, healthy body." Noble, J. Journal of Neurology, Neurosurgery & Psychiatry, May 5, 2009, online. El-Solh, A. Chest, November 2004, vol 126: pp 1575-1582. Smolik, I. Compendium of Continuing Education in Dentistry, May 2009, vol 30: pp 188-190, 192, 194, 198, 210. Offenbacher, S. Journal of Periodontology, October 1996, vol 67: pp 1103-1113. Dental Implants are becoming increasingly popular among many adults. Statistics show that 69% of adults ages 35 to 44 have lost at least one permanent tooth to an accident, gum disease, a failed root canal or tooth decay. Furthermore, by age 74, 26% of adults have lost all of their permanent teeth. You may have not known this, but dental implants are more often than not; the best treatment option for replacing missing teeth. You see dentures rest on the gum line and bridges use adjacent teeth as anchors. Dental implants are long-term replacements that your dental surgeon will surgically place in the jawbone. 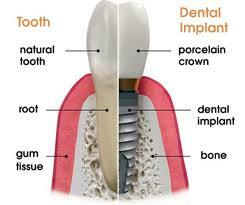 Dental implant procedures involve 3 hour long sessions. The first two are surgeries, followed by a crown or bridge fitting. The first surgery will involve implanting the metal rods into your jaw line. There will be some discomfort after the surgery but it usually isn't too extreme. After this surgery you will want to avoid sucking on straws, spitting and smoking. Your Surgeon may advise that you avoid brushing that area for a short amount of time, and may prescribe you an anti-bacterial rinse. You will also be given pain medication. In about 7-10 days your stitches will be taken out. Your second surgery will be in approximately 4-6 months. Once the implants have attached to the bone, the Surgeon will make a small cut in the gum and remove the protective screw in the implant and replace it with a metal healing cap. Make sure to keep your openings clean as there may be the risk of infection with implants. Speak with your dentist if you feel any sort of pain. Two or three weeks after your second surgery you will go back to the dentist's office and begin having your bridge, denture, or crown made. Dental Implants never slip or make embarrassing noises that advertise the fact that you have "false teeth," and never decay like teeth anchoring fixed bridges. Because dental implants fuse with the jawbone, bone loss is generally not a problem. After more than 20 years of service, the vast majority of dental implants first placed by oral and maxillofacial surgeons in the United States continue to still function at peak performance. More importantly, the recipients of those early dental implants are still satisfied they made the right choice. If properly cared for, dental implants can last a lifetime. Your new teeth will look and feel natural, and many patients have reported improved speech and breathing. But, you’ll still have to take care of it like your own teeth – see the dentist regularly, ensure proper hygiene and stop bad habits which can ruin your new implants. Many people say that your smile is the first thing they notice; if that is true it's no wonder that Zoom! Teeth Whitening has become so popular. A pearly white smile not only looks good, but it increases confidence and makes you want to smile more. With Zoom! Teeth Whitening, you can lighten your teeth up to EIGHT shades in just around an hour. It is the safest and most effective whitening system out there and is only available through participating Dentists, like us! Over time the aging process, as well as substances such as coffee, smoking, soda, tea, and red wine gradually discolor your teeth. Most discoloration requires professional tooth whitening to restore a beautiful white smile. We recommend a cleaning and an oral exam before beginning the procedure. When you are ready to begin your Zoom! 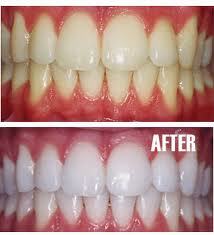 Teeth Whitening experience your dentist will cover your lips and gums for protection, and then carefully apply a Zoom! Teeth Whitening Gel. You will have three 15-minute segments where your teeth are exposed to a Zoom Lamp, which activates the hydrogen peroxide in the gel. As the hydrogen peroxide begins to break down, oxygen seeps into the tooth enamel and dentin, bleaching away any stains. There is a small amount of aftercare once your Zoom! Teeth Whitening treatment is finished. You are able to improve the longevity of your teeth whitening by brushing and flossing daily. Your dentist may also give you a Day White or Nite White at-home tooth whitening kit to take home for occasional touch-ups. Zoom! Teeth Whitening is intended to last a very long time. There are many dangers of home whitening kids. One of the dangers is that they will damage the enamel on your teeth, which is something you cannot get back. It is important to protect the enamel while still being able to effectively whiten your teeth. The benefits of having a professional dentist use the Zoom! Teeth Whitening treatment are numerous! * This is one of the safest ways to whiten your teeth. A dental professional is there to administer and monitor the tooth whitening procedure and ensure that everything works as it should. * The difference with professional vs. home kits is that the home kits take weeks and/or months to whiten your teeth just a few shades; as where Zoom! Teeth Whitening works effectively in just 45 minutes. The Zoom Lamp speeds up the tooth whitening process, lightening your teeth up to eight shades whiter. * Zoom! 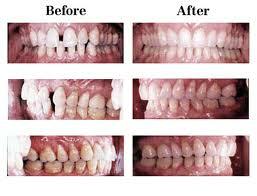 Teeth Bleaching is designed to keep your teeth looking white over a long period of time. Excellent oral hygiene and occasional touch-ups keep your smile looking nice and bright. As an April Special, Uptown Smile Dental is offering $100 OFF Zoom! Teeth Whitening! With the summer just around the corner and all that comes along with it (weddings, vacations, special occasions) Zoom! Teeth Whitening could be just what you need to boost your confidence and showcase your already beautiful smile! Invisalign. Is it right for you? Invisalign has been around since 1997 and most of us have heard of the name or know someone that has had this treatment done in the past, but is it right for you? We have found that many people qualify for Invisalign and the program can solve all different types of teeth problems without the hassle, cost, breakage and plain hideousness of metal braces. So, as you may be considering something like this for you, here's a little checklist and information gathered from Invisalign, us (Uptown Smile Dental) and multiple reviews. 1. Do you shy away from smiling because you are self-concious about your smile? 2. Do you have a "treatable case" for Invisalign? 3. Do you care what you look like wearing clear braces? 4. Would food restrictions make life extremely difficult for you? 5. Are you okay with not chewing gum? 6. Would it bother you to keep them in for 20-22 hours each day? 7. Could you handle a $200-$300 monthly payment for straighter teeth? 8. Would a 12-16 month program be worth it for the smile you have always wanted? 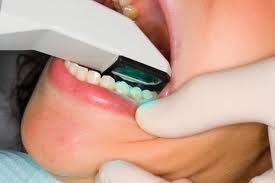 Your doctor will photograph and mold your teeth to generate a 3-D image of your smile. They will use Invisalign software to show you how your teeth will gradually shift into place, and you’ll even get to see your expected outcome. Each patient is different, though most adult treatment times last between a year and a year and a half. Your doctor will then predict how long your treatment will last based on your current alignment. 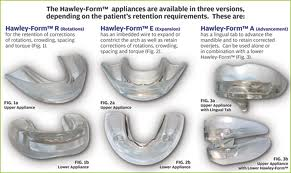 Invisalign will create custom plastic aligners especially for you. The plastic is clear and nearly invisible, thus the name Invisalign, so your friends and coworkers won’t notice they’re in place. You will be able to remove the aligners to eat and to brush your teeth and use mouthwash. During treatment your teeth will stay healthier and cleaner than they would with traditional metal braces. You will wear each aligner set for about two weeks, and then you will switch to a new set. The new set will move your teeth closer to your desired look. The bonus of Invisalign is that you will be able to see your teeth moving to their ideal positions each step of the way. Straight teeth will also improve your dental health, as aligned teeth are easier for you to floss and brush. The easier your teeth are to clean, the healthier they will be. You can top off your Invisalign treatment with Zoom! in-house tooth whitening to achieve the beautiful straight and sparkling smile you have always wanted!